This report provides a guide to mission investment intermediaries, organizations that collect capital from multiple sources and reinvest it in people and enterprises, whether nonprofit or for-profit, that deliver both social impact and financial returns. A growing number of foundations and other funders are beginning to use such intermediaries versus making mission investments directly. This is due to a number of advantages that intermediaries can provide, such as ease of investment, reduced risk, lower transaction costs, specialized expertise, performance reporting, and an expanded deal flow. Yet research disclosed that many funders are unaware of the wide range of mission investment intermediaries that are available and of the advantages they can offer. 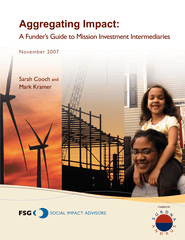 The authors provide an overview of mission investment intermediaries and how foundations use them, the benefits and challenges of investing in intermediaries, and an analysis of available intermediaries that address economic development, housing and the environment. Copyright 2007 by FSG. All rights reserved.